Monday 13th January saw society secretary Andy Exton FRAS visit Snainton Village Hall to meet the local YFC members. The society had been invited to give the group a talk on astronomy and what the society does. Unfortunately no observing was possible though after the talk due to cloud. The members were firstly introduced to the history of the society, our links with Dalby Forest, our outreach and the type of events we run. Following this brief introduction, Andy gave a talk on the types of objects in the Solar System (the Sun, planets, satellites etc.) and those outside our Solar System; firstly star clusters and nebulae before leaving the Milky Way behind and looking at galaxies. Many questions were asked at the end of the talk on areas including space travel, equipment, constellations and meteor showers. Many thanks to the Snainton YFC for inviting the society to give this talk and the charitable donation. To add, before the evening was out we had received an enquiry from another local YFC to see if a repeat could be provided for their group! 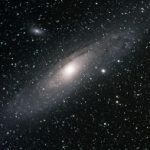 This entry was posted in News, Public Outreach and tagged Andy Exton FRAS, Galaxies, Milky Way, Nebulae, Planets, Satellites, Snainton, Snainton Village Hall, Solar System, Star Clusters, Sun, YFC, Young Farmers Club. Bookmark the permalink.